The Manual Therapy Fellowship program for The Ola Grimsby Institute provides didactic, lab and clinical instruction in advanced differential diagnosis, soft tissue work, joint mobilization, spinal manipulation, exercise and patient education. The Manual Therapy Fellowship program is accredited by the APTA through the ABPTFRE. All aspects of evaluation, soft tissue work, joint mobilization, spinal manipulation, exercise and education are thoroughly covered. The program is taught over one year including 12 weekends plus a review and written and practical examination weekend. One-to-one clinical mentoring strengthens the resident’s experience beyond simple continuing education coursework or online lectures. The Manual Therapy Fellowship builds on the Ola Grimsby Institute’s Orthopedic Residency and goes into greater depth for evaluation and treatment covering each joint. The program covers different models of pathology (neurology, biomechanical, chemical),regional interdependence relationships, movement systems, Medical screening, pathology, imaging, and nutrition are each incorporated into the curriculum. Complete aspects of patient care including psychosocial influences and chronic pain are explored in detail. The Manual Therapy Fellowship program of the Ola Grimsby Institute is accredited by the AAOMPT, in compliance with the standards set nationally and internationally by IFOMPT. Both evaluative and intervention methods taught in the Orthopedic Residency program will be re-enforced, with more advanced skills in both evaluation and intervention being a significant component of the year long education and clinical mentoring. Students will receive the curriculum from The Ola Grimsby Institute, which includes online videos, reading material, quizzes in addition to meeting in person for didactic instruction and lab experiences with an OGI instructor. The class schedule may vary from site to site, depending on the individual schedule established by individual Ola Grimsby Institute instructors. Fellows-in-training (FITs) will receive the curriculum through an online educational platform, providing video lectures, written information, testing and communication. For hands-on training and instruction, FITs meet in a classroom setting with an experienced OGI instructor. The class schedule may vary from site to site, depending on the individual schedule established by individual OGI instructors. Part of every Fellowship program is the 150 hours of 1:1 clinical mentoring. Depending on your clinical situation, this may require travel to an OGI clinical mentor to complete this requirement. Mentoring hours are free of charge from OGI instructor’s and clinical mentors. Prerequisites: Applicants to the OGI Fellowship program must first have completed the OGI Orthopedic Residency Program. Didn’t Graduate from an OGI Residency? Graduates of other APTA accredited orthopedic residency programs can also apply. For these applicants, transitional courses of MT1 (home study), MT6 (Spinal Manipulation) and at least one STEP course may be required. In addition, the MT5 Clinical Problem Solving course must be completed prior to sitting for the Fellowship examination. The Ola Grimsby Institute does not accept Specialization (OCS or SCS) as a replacement for a full Orthopedic Residency and mentorship. Prior to enrolling in the Manual Therapy Fellowship program, students must haves graduated from an APTA accredited Orthopedic Residency. 12 weekends (including Practical/Written Exams on the last weekend) over a 12-month period. Fellow-in-Training (FITs) are also required to attend 3 weekend seminars, including: MT9 Advanced Spinal Manipulation, STEP2 (knee/ankle) and STEP5 (cervical). 1:1 clinical mentoring hours – 150 Students will perform 150 hours of 1:1 clinical supervision with OGI faculty or clinical mentors. Supervised Clinical Hours: FITs are required to perform 440 hours of clinical supervision (inclusive of the 150 1:1 mentoring hours) that can be performed at the student’s routine work environment. For these hours FITs are in contact with an OGI faculty member via phone, e-mail, or other method of communication during that clinical time. FITs of the Manual Therapy Fellowship are required to complete a research project that is subject to approval by The Ola Grimsby Institute. Possible avenues of research are intensive literature review or formal Case Study. Exams: Before completion of each program, students must pass written and practical/clinical exams. Upon successful completion of the written and practical exams, students are issued a certificate of completion. For further information regarding the testing mechanisms please see the Examination Policy of The Ola Grimsby Institute. Mentoring Costs for the 150, 1:1 mentoring hours, Free! Benefits: Upon successful completion of the program, the student can apply to the AAOMPT as a Fellow. The student is responsible for acquiring the necessary paperwork from the AAOMPT and submitting it to the Ola Grimsby Institute. Internationally recognized US membership at IFOMPT. The Manual Therapy Fellowship program is the highest level of education credentialed by the APTA. Research: Opportunity to run research study proposed in Residency with opportunity of publication at the end of the year. 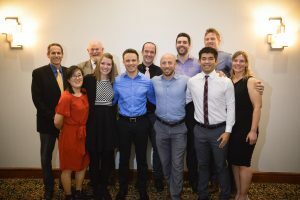 As the Ola Grimsby was a founding program of The American Academy of Orthopedic Manual Physical Therapy (AAOMPT), the OGI Manual Therapy Fellowship program has been continually recognized by AAOMPT as meeting the international standards of IFOMPT. Since the formation of the ABPTRFE, the Manual Therapy Fellowship program of The Ola Grimsby Institute has been accredited by the APTA as a post-professional clinical fellowship in orthopaedic manual physical therapy. Physical therapists graduating from the Manual Therapy Fellowship Program may apply for the Fellow credential with the Academy (FAAOMPT).